Can eHarmony Help You Find a Job? Can a dating Web site help you find a job? EHarmony thinks so. The Santa Monica-based online dating site has plans to launch a career service by the second half of next year. EHarmony may have success matching single men and women – an average of 542 eHarmony members are married every day in the U.S. according to a 2009 survey by Harris Interactive – but finding the perfect employer/employee combination could prove to be a lot more difficult. The dating site faces stiff competition from industry stalwarts like Monster.com, Career Builder, LinkedIn (LKND), Indeed.com and Mediabistro among others. 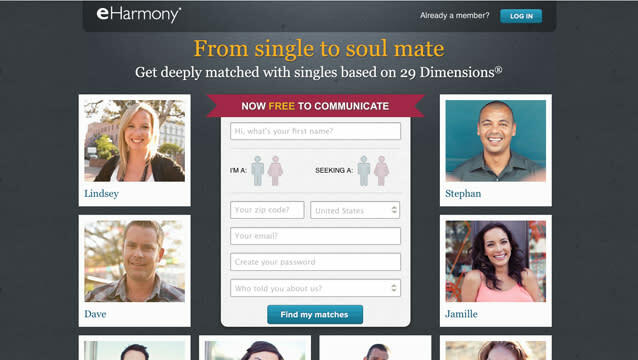 "We don’t see a company in the jobs market that is providing an 'eHarmony-like' matching service," writes Grant Langston, vice president of Customer Experience at eHarmony, in an email. EHarmony could be a game changer for employees if its career services help individuals figure out their dream jobs, says The Daily Ticker’s Henry Blodget in the accompanying video. But competitive businesses are more focused on delivering results than a providing a “harmonious” workplace for employees, he points out. EHarmony started its dating service in 2000 and has 44 million users worldwide. The company advertises that its “scientific approach to match-making” – computerized algorithms that connect men and women based on a 200-item questionnaire – works. The company will use its “unique background and expertise” to help bring together prospective employees and employers, according to Langston. “We see a real need for creating stronger compatibility between job seeker and employer – to the benefit of both,” Langston says. EHarmony Founder and CEO Neil Clark Warren told U.S. News & World Report in January that "between 50 and 75 percent of all people say they're not really happy with the jobs they currently have. If you could be fed people who are really great matches for the job you have, and their productivity was provenly higher because the match was so good, would that make it worth your while to give us a significantly more personal, private information about your culture and the people within your culture?" The eHarmony career product is still in development and the company is considering using the same compatibility system behind its dating site. Specific questions are currently being tested but one may include connecting a user’s energy level with a like-minded employer.